I'd like to say that we artist used references and it's not tracing, we spend alot of hours doing it, so i hope you know how offensive you sound. oh sorry;; thought this was traced! I really like the colours you used in this piece. Good job! Two well known online anime-y grils standin together... too cute! Wow! You made it look so much like an anime screenshot! Nice! EEEeee.. I love vocaloid so much! 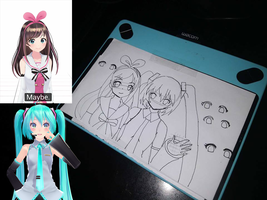 Miku and Gumi specially <3 Havne't heard Ai. This is so cute and lively! DIDDLY DANG AMAZING AND BEAUTIFUL THAT I KENNAT STOP LOOKING AT AI???? Oh... Vocaloid... My fu***n weakness!! Aa, this is so adorable! I love these two! Amazing work! Very pretty piece of art! Also, thanks for the llama. By the way, I just checked the link to your YouTube channel and was a bit unclear about what you do with it, as there wasn't much to clarify. It looks like you collect cute videos and put them together into playlists. Is that right? Ooh, okay! In that case, good luck and I hope it becomes very successful! Wow, I love them together~ Great piece of art! Funny. I just saw my first wisdom tooth for the first time today. Also, I'm not here to talk about dental stuff. I'm here to say that, traced or not, all your work shows remarkable skill that I simply do not have. I go for realistic, sometimes a bit cutesy. But me and anime are mortal enemies. You make me feel like an embarrassment. The real question remains: who's holding the selfie stick? This is great. Quick question, is comic con that fun? I wanna meet Miku too~! she said they we're made buy the same people/company though?